As we came in at 2 a.m. after our last chase day it was nice to really be able to sleep in on Day 7, which was my transition day between Silver Lining Tours and Weather Adventures. I will write a complete review of Silver Lining Tours later on but I had a good time and we got to see some amazing tornadoes on Day 2. The week had tornadoes somewhere in Tornado Alley every day but you can’t catch them all. It was great to get some time by myself and time to catch up on some work and at lunch I met up with Blake Knapp and the rest of the team that I will chase with the upcoming 10 days. Weather Adventures is much smaller than Silver Lining Tours, who had 5 vehicles and some 30-40 tour guests. On this tour we are only four tour guests. The upcoming days do not really have much to offer in terms of storms so we decided to go sightseeing in eastern Colorado instead of heading down to New Mexico, only to have to go to Montana (!) the day after. As Weather Adventures van had problem with the water cooler they rented a Suburban and we headed out to Eastern Colorado on Sunday. Our plan was mainly to visit some national parks and to photograph the Milky Way. In the evening we went out to Black Canyon national park and I tried to get some good shots with the help of my fellow tour guests. It turned out my wide angle lens (which I preferred to use) was not light sensitive enough so I had to use my fixed 50 mm lens. The result is as can be seen in this blog post – not too impressive compared to the others’ photos but it was fun to try. 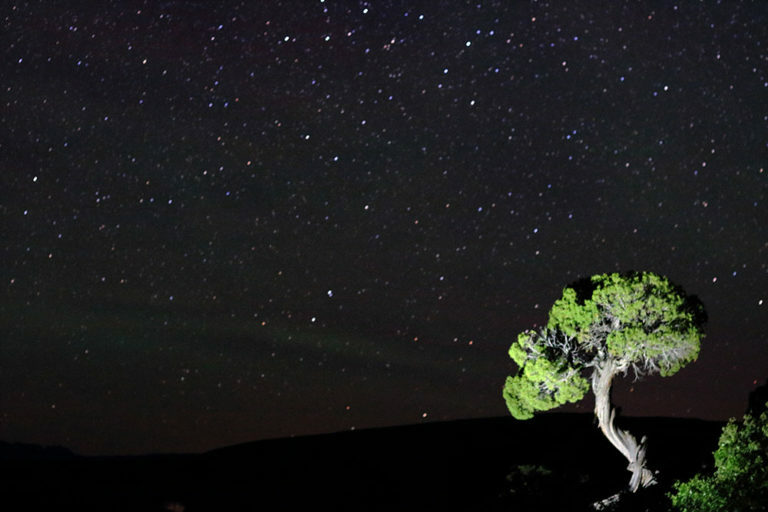 In the photo you can see a slight green glow, it is called “Air glow” which is some sort of aurora that is quite rare.